However, these benefits only remain true if you select the best battery powered chainsaw out of the plethora of available options. Here’s buying guide to help you make the best choice. 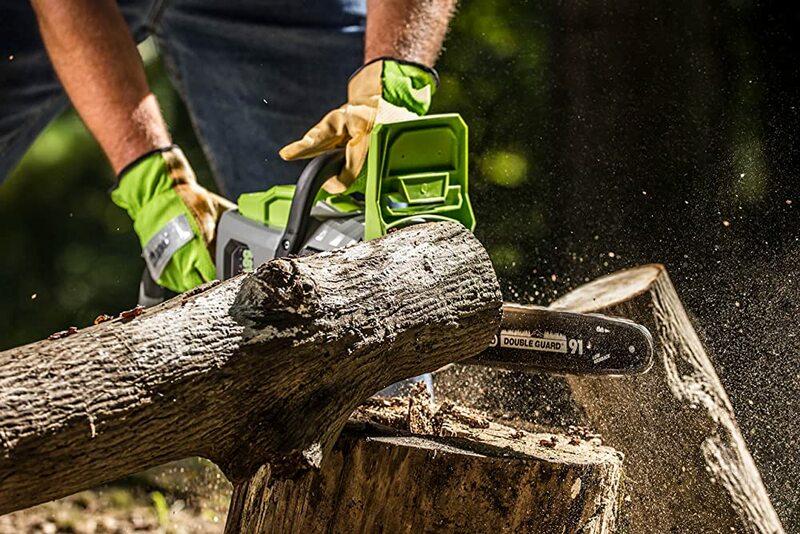 Cordless chainsaws do not come any more powerful than the Greenworks GCS80420. It delivers a powerful performance that would rival that of a gas-powered chainsaw of the same caliber, but without the hassle of fumes and oil-fuel mixing. A monstrous brushless electric motor is powered by an 80V Lithium-ion battery, allowing the saw to handle wood like a knife through butter. The torque delivered by the motor runs the 18 inches long chain and chain bar, thus making it possible to buck tree logs of around 10 to 16 inches in diameter. Another great feature of this chainsaw is its wide range of applications. It is suitable for preparing firewood, bucking medium-sized trees, pruning, and cutting the limbs. With a near zero maintenance requirement, this cordless chainsaw is indeed a great bang for the buck. A rather pleasing feat is the rapid charging feature. If you need the runout battery to pick up power fast, it takes about half an hour to fully charge the 80V, 2Ah battery. For added convenience, homeowners have the ability to use own multiple batteries, in case one goes flat. At the base of the chain bar are steel backing plates for added chainsaw stability. Featuring a wrap-around front handle and an ergonomic rear handle, this saw is well balanced and easy to handle. There are quite a number of household names when it comes to the manufacture of high-end chainsaws. Dewalt is one such brand that had built a name for itself in the production of high-quality consumer-oriented power tools. The Dewalt DCCS690M1 is one of their models for a cordless chainsaw. It is powered by a battery pack system that can either be a 4 or 6Ah unit. Buyers looking for increased cutting power should consider the large battery size. Nevertheless, the 4AH option will be fine for occasional trimming and tree maintenance around your yard. The variable trigger fitted on this model sets it apart from most of the battery powered chainsaws out there. To save on power while doing light work, stick to slow speeds. Being able to conveniently adjust the motor speed makes the saw both easy to use and comfortable since vibrations are kept at manageable levels. The 16” low kickback chain has an auto oiler that continuously emits a lubricant onto the chain link for reduced friction. You actually don’t require any tool to adjust chain tension. How easy could that be? The chain bar too has a tightening knob, thus ensuring adequate clamping force. 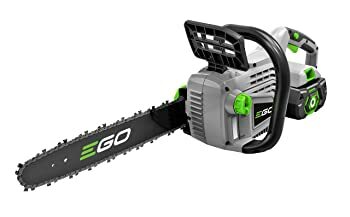 The EGO Power is an ideal lightweight option for a battery powered chainsaw. Being low on weights makes it possible to continue working for hours, without feeling fatigued. In addition, you may find it easier to control, more so if you are new to it. Rather impressively, the EGO Power is fitted with a 56 volts lithium ion battery from EGO power. The power from the battery then drives the brushless motor, delivering speeds of up to 6300 revolutions per minute. Consequently, the speed adapts the saw to a variant of cutting tasks, anywhere from clearing the light branches after a storm to preparing cords of wood. To make it safe for operators, the chainsaw uses a low kickback chain. The chain also has a braking system for effective control when it jams in a tree cut when bucking. Its 2Ah battery is part of a chainsaw kit system, including the charger. With the motor speeds, the 14” Oregon chain and chain bar comfortably makes approximately 100 cuts on a single charge. The Makita XCU03PT1 is one of the best battery powered chainsaws you can opt for. This powerhouse is powered by an 18 Volts Lithium-ion battery. 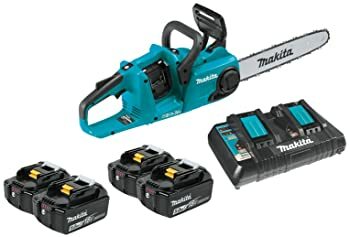 Inside the chainsaw kit is a set of four of such batteries, the charger, the chainsaw, and a sturdy carry case. A brushless motor draws power from the battery to run the chainsaw through a combination of gear drives. Brushless motor is known to require little to no maintenance as well as being highly efficient. As a result, you get work done within a short time. This chainsaw delivered almost the same cutting capabilities as a chainsaw with a 32cc engine. Fitted with a variable speed trigger, arborists get to have better tool control and charge-saving capabilities. The motor is capable of driving the chain up to speeds of 940 feet per minute. This speed can be varied in 3 steps, therefore, improving the cutting efficiency. Adjusting the chain tension requires no tools. You simply flip on the side-mounted chain tensioner. For a battery powered chainsaw, the chances of the saw getting started accidentally are quite high. To prevent any such eventualities, this Makita saw model features a lock-off lever built into the tool. In addition, an LED switch automatically switches off the chainsaw if it idles for too long without operating. The presence of a brushless motor is a good indicator of a great chainsaw option. That being said, the Oregon Cordless CS300-A6 chainsaw kit comprises of a tool made with one of such motors. Therefore, it exhibits high energy use efficiency for optimum motor performance. Its efficient motor aside, it is the 40 volts Max Lithium-ion battery that is responsible for the high cutting torque generated by the motor. As such, the 4.0AH battery results in increased run times, without compromising on the cutting speed and torque. One feature that’s not common in the best battery-powered chainsaws but presents in the Oregon CS300-A6 is the PowerSharp system. 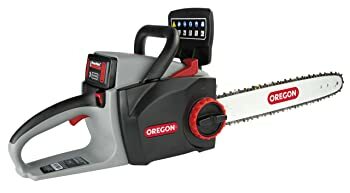 It offers you a way of sharpening the chainsaw while on the job, and within a couple of seconds (I think it takes about 3-4 seconds). There is also the added advantage of electric chainsaws of an instant start by the press of the lever. Another great feature is the high-quality construction of the battery cells. These constantly produce a no-fade power, even when the charge is running out. Moreover, under normal usage temperature conditions, a single charge typically lasts for about 400 cuts on 2-3 inches thick tree branches. Ideally, the trees you will probably be cutting will not be all 2 inches, it still gives a great account of the chainsaw’s capabilities. Well, these chainsaws are referred to as battery powered for a reason. Since it is in their names, it is, therefore mandatory to give due consideration to the battery which each chainsaw is fitted with. To a great extent, the battery is what determines the runtime and the overall performance level of the chainsaw. The first thing you should check is the battery type. Lithium-ion and Nickel-cadmium are the most common options available. Between these two, Lithium-ion batteries are the best options. These discharge a constant amount of power during discharge. Also, Lithium-ion batteries have a lower recharge time. In order to minimize your downtimes, look for a battery type with the longest runtimes. Power, speed, and runtime are all influenced by the volts and ampere hours of the chainsaw battery. While some brands indicate inflated voltage ratings, you can still take the battery voltage readings to be sure. By multiplying the tested voltage reading and ampere hours, you can derive the chainsaw watt-hours. This value is a great representation of the value you will be getting for your money. When purchasing anything that will be valuable to you, it is in your best interest to get a reliable item, more so if it is an expensive investment. The best battery-powered chainsaw is no cheap either, thus an attractive warranty is an indicator of its reliability. While most of those who buy battery powered chainsaw are DIY homeowners, there is still a good number of professional and commercial users who buy them. As such, I would recommend a warranty length of between 2 and 5 years. In case of any chainsaw mishap out of your control, then you can contact the manufacturer for a replacement or repair. Pro Tip: There are certain manufacturers with a tendency of backing down on the warranty, or taking consumers in circles. Do a little research on how they respond to warranty claims before settling on their product. The main working elements in a battery chainsaw are the batteries, the brushless motor, the chain bar, and chainsaw. Despite their relatively small stature, I have always been impressed by the amount of power some of these chainsaws have. 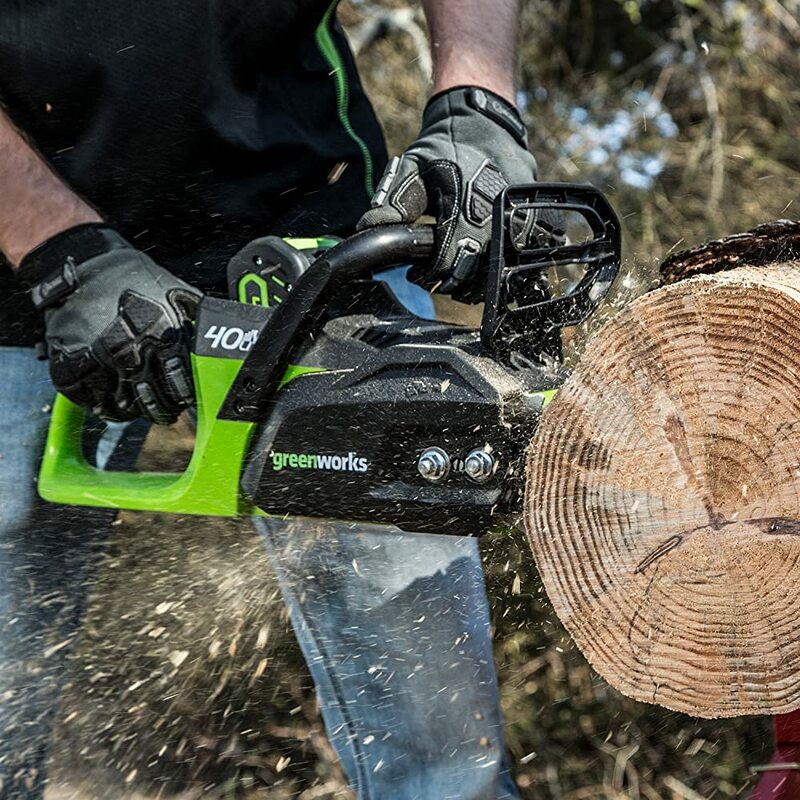 On average, a chainsaw fitted with a 40 Volts battery and a 14-16” chain bar can comfortably handle tree limbs ranging from 4 to 11 inches in thickness. As the battery voltage increases, so does the cutting ability, and so does the price of the chainsaw. However, for the same battery size, increasing the tree branch thickness has a compounding effect on increased power consumption. Consequently, the battery drains at a faster rate than before. First, I’ll reiterate that the comfort of a chainsaw is a pretty subjective topic. No single two people are likely to have the same idea of what entails a comfortable chainsaw. However, this does not eliminate the fact that certain designs are ergonomically comfortable than others. One aspect of ergonomics is how well-balanced the chainsaw is when held on the front handle with your left hand. A comfortable design should have the saw balancing in a fairly horizontal position. If this is not the case, then a front tilt should be okay, but not a rare tilt. A chainsaw that is too heavy on the rear lifts the front part towards the operator, hence requiring increased vigilance and operating effort. Additionally, consider how comfortable the handle is. Rubberized handles provide great padding and a better grip. Trigger sizes that allow for the use of two fingers for a better grip stance offer user comfort. All in all, the weight of the chainsaw should also be manageable. The best battery powered chainsaws feature a range of safety features, all meant to make them safe. Irrespective of their subdued power, these tools are still very dangerous. 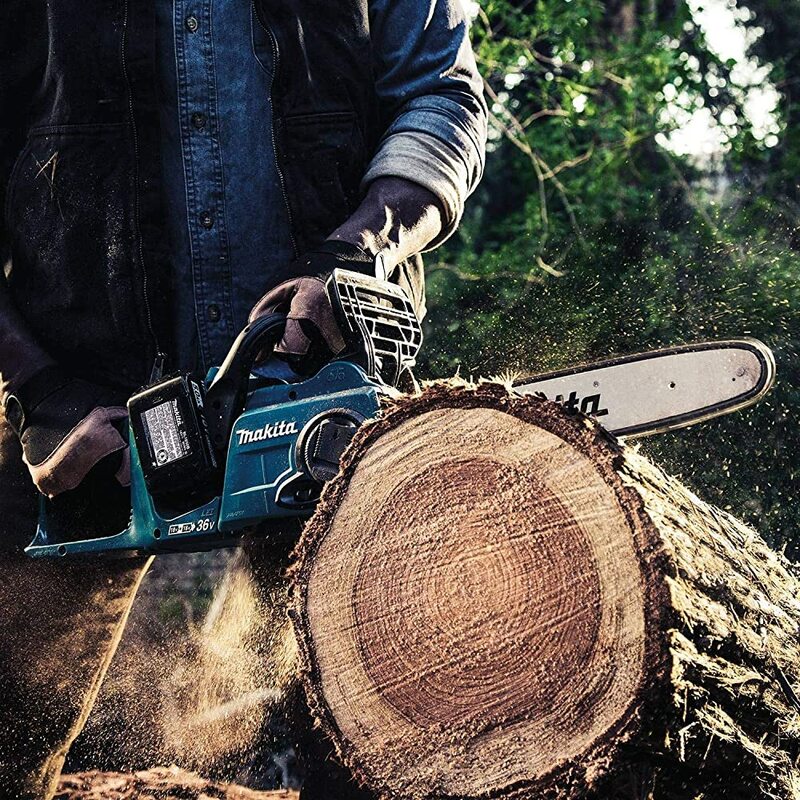 Look for features that automatically switch off the chainsaw if left on after some time. While some of these features are unique, others are common such as chain brakes in the event of kickbacks. It is the Electronic Protection System (EPS) that’s not so common. It keeps the motor from overheating or being overloaded by switching off the chainsaw. Another safety feature is the two-step lockouts, to alleviate potential un-intended start-ups. While these aim at making the devices safe to use, they can be an inconvenience particularly when reaching around the tree to make another cut. A chainsaw going off after every 4 seconds on non-use isn’t in your definition of a great afternoon out in the woods. The lubricant is the lifeblood of your battery-powered chainsaw or any other saw for that matter. No single chainsaw has the capacity of running for long without the essential oiling. Within a short time, the chain bar would heat up and snap into pieces. While most of the best battery powered chainsaws oil themselves readily and automatically, some have a tendency of spilling the oil in storage. Other saws experience clogged lubrication holes. These would require constant monitoring and clearing of the clogs for efficiency. Also, it is noteworthy to have an oil reservoir that you can conveniently refill when need be. Consider how easy it is to replenish the oil supply without having oily hands. Selecting the best battery powered chainsaw is a tricky affair. Because of the subjective nature of the features that you should be considering, there isn’t a one size fit all for chainsaw junkies. I may appreciate battery life, while the next guy fancies a light power tool to work with. On the other hand, you might be on the lookout for a chainsaw with an easy to top up oil or accessible no tool tensioner. Still, I believe these battery-powered chainsaws make the cut in meeting almost your every need. Whereas it’s difficult to choose between options on which is the best, there is always your favorite product, right? In my opinion, I think the Greenworks GCS80420 PRO 18-Inch 80V Cordless Chainsaw is the best battery powered chainsaw option. Despite its small size, it produces enough power to rival a gas powered chainsaw of the same size. The 80 Volts, 2AH battery gives enough juice to power the 18” long chain bar and chain through relatively thick branches. Since the battery is Lithium-ion, runtimes are extended, while retaining a constant speed until the charge runs out. 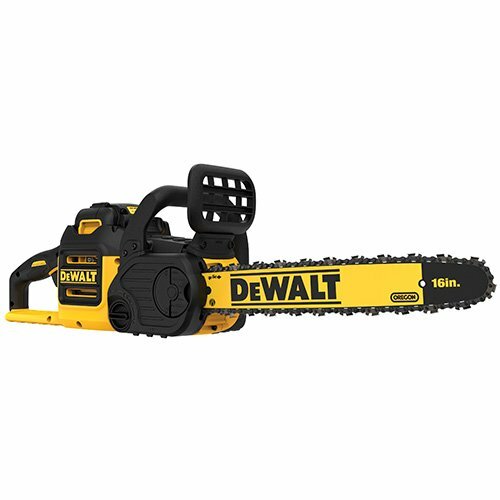 These features make it a highly sought out battery-powered chainsaw among both regular and occasional users.